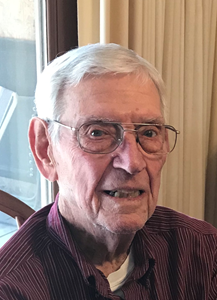 Robert E. “Bob” McKnight, 94, of Topeka, Kansas, passed away March 18, 2019. Bob was born February 19, 1925 the son of Henry and Lottie (Adolph) McKnight. He attended Eskridge High School and was a World War II veteran. He spent 45 years in construction and was a home builder in Topeka until he retired. Bob is survived by his wife, Patricia of 72 years; daughter, Vicki (George) Morrison; son, Randy (Joy) McKnight; grandsons, Tyler Morrison and Craig McKnight; four great-grandchildren; nieces and nephew. A private family graveside service will be at 11:00 a.m. Tuesday, March 26, 2019 Memorial Park Cemetery, 3616 SW 6th Street, Topeka, KS. To share a memory of Bob or leave a special condolence message for his family, please click the Share Memories button above. Add your memories to the guest book of Robert McKnight. Vicki and family, I am so sorry to hear about the loss of your dad. I have wonderful memories from our high school days including the kind and welcoming ways of both your parents. I am thinking of you at this time. So sorry for your loss. I delivered meals to Mr and Mrs McKnight for several years and always looked forward to his smile when he met me at the door. Even through health challenges both Mr and Mrs McKnight were positive, helping me understand the importance of appreciating the blessings we have and taking each day as God offers it to us. Randy, I am thankful for all the time I was able to spend with Bob. Bob was a great mentor and friend. I will always appreciate all that he and yourself did for Highland Homes. Take care and know that my thoughts and prayers are with you. Uncle Bob meant so much to me. I will miss him. He was my mom’s youngest brother. Our family moved to California in 1952 but, we made it back to Topeka almost every summer. we stayed with Grandma McKnight and my Uncle Bob and Aunt Pat's house. Always such fun with the McKnight's!!! I love you all so much!! We are so sorry to here of Bob's passing. My Dad, Arnie Lietz, has really great memories of riding back and forth to work with Bob years ago. Bob was always such a lovely person and my family is glad to have known him and we are sending love and prayers your way. Pat, I was so sorry to see the obituary today of Bob's passing. It seems it is always too late to say that you wish you had taken the time to see a friend as I think about the numerous times I drove past your house without stopping. I will always remember the dedication to building my house that Bob showed forty-one years ago --- and I cherish forever the friendship you and Bob showed to me and my family, plus the North Star "visits" and the unplanned "happy hours."